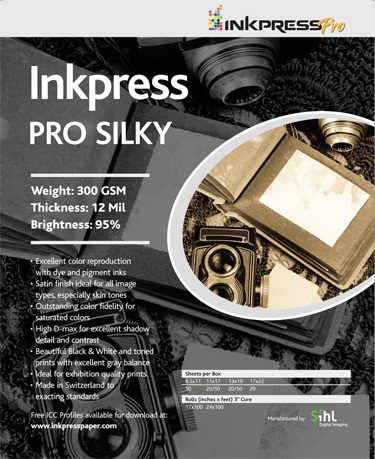 Inkpress Pro Silky offers an outstanding surface that allows handling without fingerprints or artifacts. Gloss and surface reflectance of the silky finish remains the same in printed and unprinted areas when using pigmented or dye inks. Consistent reproduction of hue, saturation, and brightness, print after print, is the promise we've built into our Inkpress Pro assortment. Your images come into their own with our media. If you are using a Canon printer you will NOT need ICCs from Inkpress. Use the default/preset ICCs that are included with your printer. Canon has done a phenomenal job in ensuring their printers output high quality calibrated images, even for third party paper manufacturers. The paper (media) setting for PRO SILKY is: PHOTO PAPER PLUS SEMI-GLOSS (II): (using Canon SG ICCs).